Do you know the meaning of the title of this tune? In the Ultimate DJango book it is said that R26 is a reference to the home of a certain friend in a certain street. Later, we learned that it was the house of the parents of Jacotte Perrier. But did you know that the name R26 is not an invention of Django and Stephane? 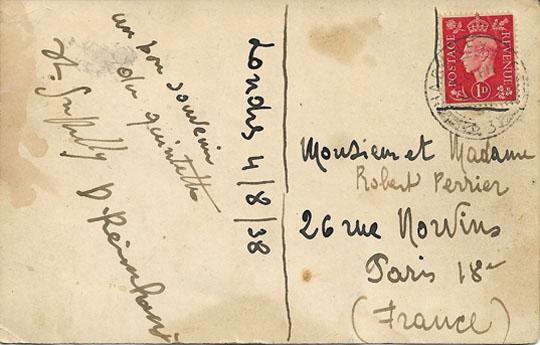 I just read that it was the name of a private club (gathering of famous artists in Montmartre) held by Robert (R) Perrier and his family at their apt 26 rue Norvins. Check the photo at the top of page 275. That's the owner on the piano. The meaning is R for Robert and 26 for 26 Rue de Norvins. It was a non-declared association created for fun by Madeleine and Robert Perrier and some friends. They used to organize private parties and both Stéphane and Django went there often and composed "R26" as an anthem for this secret club. Jacotte Perrier was the daugther of Madeleine and Robert she was only 13 years old when she recorded with Django and the HCQ "Les Salades de l'oncle François" a song written by Jean Tranchant that was welcomed at the R26. Some magnetic tapes and films do exist on the R26 activities but might not be easy to reach. The R26 had a long life from 1930 to 1960. It was definitively closed by the daughter of Jacotte Perrier in 2014. And pdf document attached directly, since these webpages have an unfortunate habit of disappearing with time. So, it sounds like it was kind of like a speakeasy..? Well more than a speakeasy it was a salon similar to the salon that Gertrude Stein had created and it was a meeting point where some leading figures of music and Art would meet from time to time (Joséphine Baker, Django, Stéphane, Tranchant and many others). The Perrier loved Jazz and composed many songs (but not Jazz). 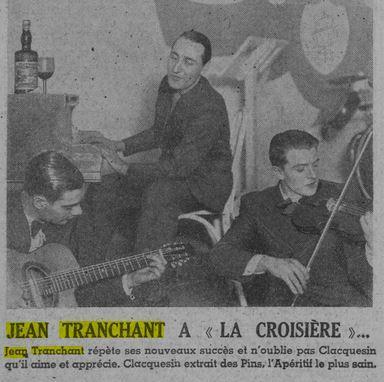 Here below is Jean Tranchant with Warlop in his own Club "La Croisère" on 20 Rue de Clichy in Paris in March 1935. The club was closed in 1935 after its director was killed by the french mafia. Tranchant will soon open a new Club "Le Bagdad - Chez Jean Tranchant" in a better place at 168 Fg St Honoré in Paris in november 1935. 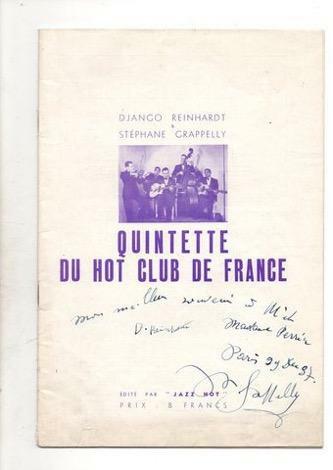 He will also play with Django and Stéphane and the HCQ in a concert organized by Marcel de Valmalète who was the Artistic Director at "Salle Rameau" on June 13th 1935 and with them again in some Radio broadcasts at Radio Luxembourg. Jean Tranchant has been (amazingly for me) a true star in France in those years. Singer and writter Nane Chollet who also recorded a few songs with Django and the HCQ was Jean Tranchant's wife. Tranchant's carieer ended a little after the end of WW2 as he was then considered as a german collaborator. That's Baro Ferret with Tranchant and Warlop. Great pic.